As part of the Dodd-Frank Wall Street Reform and Consumer Protection Act passed last year, the Federal Reserve was given the task of setting debit card fees. Fees have been averaging 44 cents per transaction. (That's why coffee shops and other small retail outlets ask that you purchase at least $5 with your debit card. They lose money if you buy less.) A study by the Fed (PDF) shows there were 15.6 billion transaction in 2003, 25 billion in 2006, and 37.9 billion in 2009, so we are talking billions of dollars in fees being collected every year. Consumers pay these fees because retailers pass that cost on to them. Back in December, the Fed's proposed rule was a cap of 12 cents per transaction. Yesterday, the Fed released the final rule capping the fee at "21 cents per transaction and 5 basis points multiplied by the value of the transaction". If I understand basis points correctly, a $100 debit card transaction will yield an additional 5 cents in the transaction fee. So what does this mean for you or me? Basically not much when it comes to retail purchases. The exception may be the odd local place like Froyo Earth where you get a discount if you pay in cash. Other than that, don't expect to see price reductions. But do watch for ways that financial institutions will use to recoup their lost fees. Like addicts they are hooked on those billions and they'll do everything they can to keep pumping that junk into their arms. A Spokane police officer who hit and killed an intoxicated pedestrian in his patrol car in January was typing a message into his onboard computer just before the crash. This was ruled a contributing factor to the pedestrian's death. A "clearly contributing factor" was that the pedestrian who was intoxicated. The pedestrian was also wearing dark clothing at night, had a history of alcohol abuse, had been struck by a car before and had been cited for being in the roadway. Apparently it does not matter that the deceased John A. Van Curler was in a crosswalk when he was struck by a speeding police car whose operator was distracted as he typed a message into his onboard computer. The Revised Code of Washington allows for operators of authorized emergency vehicles to be exempt from the restriction of sending, reading, or receiving a text message. The officer's onboard computer could easily fit within the definition of a wireless communications device. The operator of an approaching vehicle shall stop and remain stopped to allow a pedestrian or bicycle to cross the roadway within an unmarked or marked crosswalk when the pedestrian or bicycle is upon or within one lane of the half of the roadway upon which the vehicle is traveling or onto which it is turning. There are no exemptions for intoxicated pedestrians or pedestrians wearing dark clothing at night. The code also states that pedestrians will not suddenly leave the curb "into the path of a vehicle which is so close that it is impossible for the driver to stop". There was no mention of Van Curler suddenly darting out into the crosswalk. And how would we know? Officer Gordon Ennis struck him while speeding and distracted. What we have is a heavily intoxicated Van Curler wearing dark clothing and a speeding Officer Ennis distracted by typing a message. Investigators believe Ennis had a green light but no supporting evidence for such a claim is given in the article. If you look at the intersection of Monroe and Montgomery, you'll find it's well marked with no obstructions and it has two overhead street lights. For me, the primary issue here concerns holding a police officer responsible for his actions. Much is made of the dangers the police face as a part of their duties. Being former law enforcement myself, I can appreciate that. But does protecting public safety excuse an officer when he violates public safety? Are officers not accountable for their actions when someone they mistakenly victimize is too drunk to know what's going on? Officer Ennis admittedly was inattentive and it resulted in the death of an innocent man and Officer Ennis remains on the police force. Sadly, not only will Officer Ennis have to live with this for the rest of his life, he'll also be able to do it again. Back in 1998, in response to rampant political corruption, the people of Arizona passed the Arizona Citizens Clean Elections Act. The act allowed people running for office to fund their campaigns with state money. But there were conditions. The candidate had to raise a certain number of $5 qualifying contributions within a specified time period. They could not accept private donations. They could not spend more than $500 of their own money. They had to participate in at least one public debate. Candidates received a predetermined lump sum amount. If a privately-funded candidate out spent them during the campaign, then the state would grant the publicly-funded candidate ninety-four cents for each dollar they were outspent by. But the maximum amount the publicly-funded candidate could receive was capped at three times the amount of the initial lump sum. A privately-funded candidate was free to raise and spend unlimited funds. The intent of the Clean Elections Act was to create conditions for greater citizen participation in elections and reduce the likelihood that elected candidates would be beholden to private financiers instead of the public. Publicly funded elections allow more, and more diverse, people to run for office. The US Supreme Court, in a 5-4 ruling (68-page PDF), determined that the state's matching funds were unconstitutional. Why? Because it imposes a substantial burden on the political speech of the privately-funded candidate as well as on an independent group spending money on a campaign. If the privately-financed candidate spent more money than their state-funded opponent, the state-funded opponent would receive matching funds up to a point. Consequently, the burden placed on the privately-financed candidate is taking into account that spending more will allow the publicly-funded candidate to spend more--up to a point. More privately-funded political speech would result in more political speech from the publicly-funded candidate--up to a point. Chief Justice Roberts says that is unconstitutional and that there is no compelling state interest for providing matching funds. Here is how the system works. If Candidate A is running for the Arizona state legislature and agreed to public funding and made it to the general election, they would receive $21,533 to run their campaign. If their privately-financed opponent, Candidate B, spent more than that amount, then Candidate A would receive $.94 for every dollar Candidate B spent above $21,533. If an independent organization spent money for Candidate B or against Candidate A then that would count also. But Candidate A would receive no more than $64,599 or three times the amount of the initial lump sum. Candidate B--and independent organizations--are free to spend as much as they wish without limit. It will be interesting to see just how much more the privately-funded candidates and their supporting organizations will spend in Arizona now that they are no longer unfairly burdened with a keel that was even--up to a point--and now that there is no compelling state interest in reducing political corruption. I know the opinion is 68 pages long, but it's worth reading--especially Justice Kagan's evisceration of Chief Justice Robert's majority opinion. A certain someone got her learner's permit a couple days ago. She starts driver's ed classes next week. 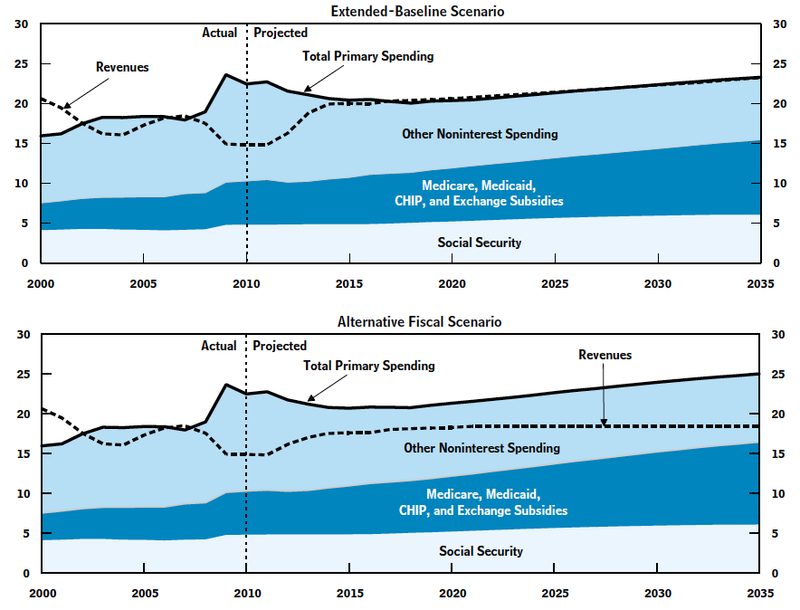 The Congressional Budget Office recently released its 2011 Long Term Budget Outlook. It's 100-plus pages of dry, yet important, economic forecast. I don't pretend to understand it all. The document presents two outlooks. One is called the Extended-Baseline Scenario which "adheres closely to current law." So if a tax is set to increase or decrease sometime in the next ten years, then this scenario assumes that will take place. The other is called the Alternative Fiscal Scenario. It "incorporates several changes to current law that are widely expected to occur or that would modify some provisions of law that might be difficult to sustain for a long period." I.e., the Path to Prosperity that the Republican Congress was all heffered up about until the people got all heffered up about Medicare becoming a voucher system. Anyway, this chart on page 4 caught my eye. You'll notice that if we leave everything alone for the next four years then revenues will cover expenditures. Note that this doesn't include interest payments on the federal debt. Also note that following the alternative scenario puts us even deeper in the hole as tax revenues fail to match spending. The path to prosperity indeed. A major contributor to this is the "taxes are off the table" mantra that sells so well in society. If it's repeated enough, many people will believe that they pay enough taxes, that government can't help but be wasteful, and that raising taxes will doom us as a nation. 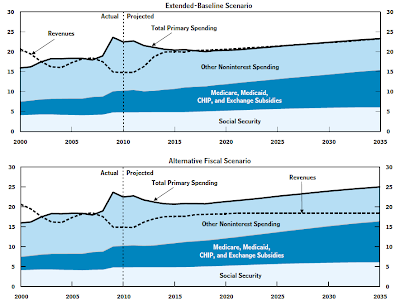 There's an important statement on page 52 of the budget outlook in the chapter concerning Social Security. When earnings inequality increases, as it has in recent decades, the taxable share of earnings declines. In other words, as fewer people make most of the money, most of the people who make less are unable to contribute enough to sustain the system they are supposed to benefit from. It's easy to see how that applies to Social Security, but the same principle applies to the rest of our local, state and federal governments. If you want want law enforcement, fire protection, schools, etc., then you have to pay for them. And if most of the earnings are going to fewer people, you have to raise taxes for them because that's where the money is. Or you can promote selfishness under the guise of limited government, corporations acting in their best interest, government regulation is bad, and pulling your own weight in a system that heavily favors the few. The alternative is clear. Rather than haul them back and forth, I usually keep my work shoes at work. But I ran to work yesterday which means I wore my shoes home. Guess what I forgot today? Fortunately, my bike shoes made for passable casual shoes today. Josh and his friends are playing in Hoopfest again, but under a different team name. That's right. There's no Pen Island in this year's tournament. If a team name is considered inappropriate then tournament officials rename the team with team captain's last name. Pen Island got flagged as inappropriate. The Pen Island team is disappointed but they're being good sports about it. Of course, Josh couldn't help but point out that based on the names that are being permitted, the standard for defining inappropriate team names is pretty much undefined. He has a point. Some of the double entendre can be a tough call for the tournament officials. There's a plethora of Ballers. Big Booty Ballers, Old School Ballers, Lady Ballers, Five AM Ballers, and even Ecdysiast Ballers. There are so many ballers you'd think almost everyone playing in the tournament was a baller. We also have the coed teams of Four Balls Two Dolls, Balls and Dolls, and Balls n Dolls. Presumably Balling All Day can...um...play basketball all day. Yeah. I think the first Summer Parkways for this year went very well. Lots of folks were walking, running, riding, rolling--even walking on stilts. Many of the people living along the route were in the spirit. Music played. Jump ropes were offered. A number of young entrepreneurs were selling lemonade. After two lemonades and a Gatorade--accompanied with a complimentary chocolate--I arrived at a very crowded canopy where they were giving away root beer floats for a donation. I wish I could have stuck around long enough to get one. On the way to work this morning I found a Public Works crew working on markings for striping and bike lanes on Country Homes Blvd between Division and Wall. Shawn Vestal over at the Spokesman Review has written a pretty good article on the photo red camera program. The real bottom line: Once the program starts draining the revenue stream instead of contributing to it, it will be terminated. It may claim to be a safety program, but it won't be one the city will pay for. Yesterday, the first day of a long awaited summer, I spotted the morning dew steaming off a mailbox on my commute. Photo Red is in the news again (Spokesman Review), but this time it's about a technicality. The system requires that a police officer review images from the cameras, then decide whether an infraction has occurred. If so, the officer punches an “accept” button, sending an electronic signal to Arizona-based American Traffic Solutions. That company then affixes the officer’s signature to the ticket before mailing it to the driver. Clark, and later Chuang, argued that state law requires that any signature signed under penalty of perjury must be written in Washington. It's a legal technicality I'm sure the city will find a way to overcome. Why? Because the program, touted as a safety program since its beginning 2-1/2 years ago, has proven its worth as a revenue generator which Mayor Verner proposes using to hire more police officers. Here's a reminder of what was said in January 2010. While it may be too early to judge the effectiveness of the cameras in Spokane, they have succeeded in catching violators and raising revenue. Spokane issued 5,690 camera tickets that resulted in revenue of $419,000, [Officer Teresa] Fuller said. 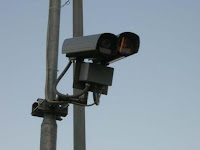 After the contracted camera company, Arizona-based American Traffic Solutions, is paid and other expenses subtracted, police estimate a profit of $103,000. I'd like to see the numbers of tickets issues each month. Are they on the decline at each intersection because the system is acting as a deterrent? How about the number and types of accidents attributed to red light running at each intersection? The program is 2-1/2 years old so there should be plenty of numbers by now. I'd also like to see a categorization of the types of violations. When you think red light runner you probably imagine someone blasting through the red light. But if that were the case with these thousands of violations, it seems there would be a lot more accidents--unless Spokane has lots and lots of really lucky people. How many of these violations are of the "letter of the law" type such as stopping over or just past the stop line instead of in front of it and how many are blatant red light runners? In the meantime, I offer this suggestion for solving the problem of affixing the signature to the tickets here in Washington. An autopen. The could pay for it with the money they make from the Photo Red program. And it would be a wise investment especially since they plan to expand the program to other revenue generating intersections. An idea that's pure gold--as it was intended in the first place. Here's part of an email I received from Barack Obama's 2012 campaign that actually ended up in my spam folder. Too funny. I've set aside time for four supporters like you to join me for dinner. We didn't get here doing that, and we're not going to start now. We're running a different kind of campaign. We don't take money from Washington lobbyists or special-interest PACs -- we never have, and we never will. We rely on everyday Americans giving whatever they can afford -- and I want to spend time with a few of you. I realize the purpose of this is to raise funds for the campaign, but I have to wonder if whoever thought this up figures Americans are bad at math. What's that? Oh...um...nevermind. I hope I don't get hit by lightning (1/1,000,000) on my walk to the store for Powerball tickets (1/195,249,054). But wait. You don't have to contribute to Obama's campaign to win! According to the rules you can just sign up instead. If I win I could ask him about the stepped up drone attacks, violating the War Powers Act in Libya, being the first president to authorize the assassination of an American overseas, or the torture of Bradley Manning. If I don't get hit by lightning first. Our industrialized agricultural system not only results in lots of food, but lots of dirty food. In today's Spokesman review we have an article about irradiating food to make it safer. Irradiated meat has been around for years, particularly ground beef, a favorite hiding spot for E. coli. About 15 million to 18 million pounds of U.S. ground beef are irradiated every year, says Ron Eustice of the Minnesota Beef Council. That’s a tiny fraction of the nation’s hamburger, and it must be labeled so consumers can choose – although some retailers advertise irradiated hamburger as a safety selling point. Thorough cooking kills E. coli and other germs, but people don’t always get their meat hot enough. Still, Americans get more irradiated foods than they realize. About a third of commercial spices – the kind added to processed foods – are irradiated, says Eustice, who’s also a consultant to the Food Irradiation Processing Alliance. About 30 million pounds of imported produce, mostly fruits such as guavas and mangoes, get a low-dose zap, not enough to kill germs but to kill any foreign insects along for the ride. I wonder if we're considering nature's ability and propensity to adapt. Bacteria have evolved to withstand antibiotics. Can't germs and bugs evolve to withstand irradiation? We may find out fifty years from now. Irradiation isn’t an excuse for dirty produce, [Dr. Michael Osterholm, a University of Minnesota infectious disease specialist] says. It’s far better to prevent contamination on the farm or in the processing plant than to try to get rid of it later. But it’s impossible to prevent all animal-borne bacteria in open fields. There’s no reason to fear irradiation, but “there’s no silver bullet here,” cautions food-safety expert Caroline Smith DeWaal of the Center for Science in the Public Interest. Irradiation doesn’t kill viruses that also sometimes taint food, and it adds to the food’s price, she says. Consumers’ biggest desire: Make cleaner food in the first place. The underlying message there: Buy local - You're less likely to eat s#!t. We try to make dinner time fun at our house. Consequently, we have some of the strangest and funniest topics of conversation. Last night's included starting a north-side Flying Irish for the O'Doherty's that just opened at Division and Hawthorne, how Kathy should run in underwear at least once, Josh's four-pound weight gain (whoa, you got fat) since the fall and Colon Flow. Don't ask how we made the transitions. We just let nature take its course. One day Steph will write funny stories about our dinner conversations. She should because she tells them so well. I'm a huge fan of word play so at the end of dinner I thought I'd play with Steph and Josh. Steph: "How can you do that? You don't have a coin." Me: "It's an imaginary coin and you have to call it right. What do you call it, Steph?" Steph: "Whatever side is facing up." Me: "What do you call it, Josh?" Josh: "I call it right." Steph: "What? You can't call it right. There's no right. It's a coin flip. It's heads or tails." Josh: "Dad said whoever calls it 'right' clears the table. I called it 'right'. Get it?" Steph: "How'd you know to say that?" Josh: "I got it right away." Steph: "(to me) That's not fair. You said you were flipping a coin. That's stupid. (to Josh) Nobody gets that." Me: "An imaginary coin. And I said you get to clear the table if you called it 'right'. 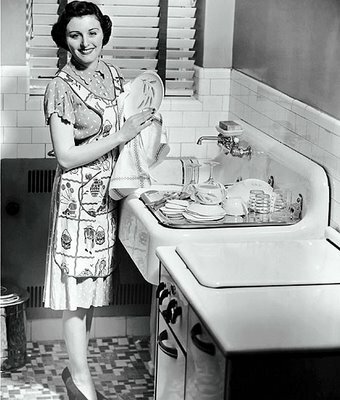 You called it 'whatever side is facing up' so you're washing dishes." One more story for Steph to tell. Although this one may surface during a therapy session. Kathy can only shake her head and wonder how she's going to survive thirty more years with me. Place one on the thumb and each fingertip. Savor the taste of each one. I've been stewing over the news about the University of Washington is proposing raising tuition rates by 20 per cent. Tuition is skyrocketing because the Legislature has dramatically cut funding to higher education. Over the last three years, the amount of money the UW receives from the state has fallen 50 percent. The UW has eliminated hundreds of positions, cut classes, increased class sizes and frozen faculty salaries for the last two years. Under the current budget, faculty salaries will be frozen for two more years. College is a very expensive deal nowadays and I appreciate the school has taken steps to help offset the decreased funding from the legislature. Here's the part that really irks me. In addition, [vice provost Paul] Jenny outlined a proposal to the regents that about half of the money raised through the tuition increase be added to the financial-aid pot. That would raise enough money to cover the tuition increase for the neediest students and also provide enough to award grants of up to $4,000 for as many as 1,000 students, going beyond what the state required for financial aid and helping some middle-class students, Jenny said. In other words, the students--and parents--that can either afford the tuition or are able to borrow the money to pay for tuition will now subsidize other students. I can appreciate the need that the neediest students have. And I understand that our state's sales-tax-based economy is hurting in this Lesser Depression (Disclosure: My uncle's site). But it bothers me a lot that the cost of my child's education is being increased and then half that increase--instead of being an actual cost for my child--is being diverted to someone else. Josh is home from UW. My nephew, Andrew, graduated from Eastern. We had tons of family over for the weekend so you know what that means. Party time! Of course, we're obliged to take lots of kid photos. Andrew with his niece, Riane, who also turned one year old. Niece Taylor hanging out at the pool. Kathy and Josh. Home from school. Brother-in-law Charlie with his granddaughter, Taylor. Gimme more ice cream cake! Riane pondering the deeper meaning of...um...whatever a one-year-old ponders.